In fact, although UNDP never emailed or telephoned media who, like Inner City Press, had RSVP-ed for the event, UNDP knew that Karzai would be late, then that he would not come at all. He met instead with NATO. UNDP's David Lockwood told Inner City Press that, rather than being driven the seven blocks from UNDP HQ to the hotel, Mr. Dervis walked. The area in which he sat was marked off by a velvet rope which kept the audience at least thirty feet away. 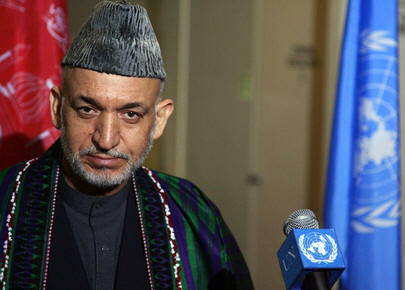 The "David Morrison script," also helpfully left in stacks on chairs in the back of the Astor Room, has Morrison saying "we are expecting at any moment the arrival of President Hamid Karzai of Afghanistan who has been held up," and then "because of their extremely tight schedules, President Karzai and Mr. Dervis will not be able to take any questions." The event was advertised to the UN press corps in a "Media Advisory," which did not note that Dervis would not take any questions. While Dervis has not held a sit-down press conference in UN Headquarters since December 2006, earlier this month he did a scandal-focused stakeout interview, at which he told reporters that he would meet with UNFPA's Thoraya Obaid and others on September 21 to deal with the incongruity of his position that the UN Ethics Office cannot have jurisdiction over UNDP. No update has been provided. Nor, following Inner City Press' September 21 questions to UNDP's Olav Kjorven and Ben Craft, have any responses been provided regarding UNDP's involvement in diamond mining, and allegedly smuggling, in Zimbabwe. That's enough, UNDP's Ben Craft cut in on September 21, stating that the questions had be remain tied to climate change. Similarly on Wednesday, when Inner City Press asked questions about UNDP's operations in Afghanistan -- whether they are "nationally executed," whether UNDP works with the Taliban and questions about its audits -- the agency's David Lockwood responded that the question were too "UNDP specific" and would have to be "dealt with separately." While afterwards Mr. Lockwood provided some useful information about his time in Afghanistan in the 1990s, in the eleven hours since the briefing not a single piece of information about UNDP in Afghanistan, ostensibly the topic of the advertised press conference on Wednesday, was provided. The questions which unlike Inner City Press' were answered on Wednesday were generally from laudatory graduate students, who apparently would like to get jobs at UNDP. When these are the only questions that senior UNDP officials deign to take, their lack of accountability and transparency only grows worse. On the positive side -- and we do try that -- one of UNDP's guest speakers was Doctor Barney Rubin, who in response to Inner City Press' question about UNAMA's Tom Koenig's statement about helping to pass legislation on private military companies like Blackwater USA, spoke candidly about the issue. ("He must not be a UNDP official there," one wag remarked after the press conference.) Rubin said that recently Afghanistan's Attorney General tried to have arrested some personnel of one military company, staffed by a former Afghan militia. Instead, this militia, USPI, arrested the Attorney General and detained him until he apologized. Rubin spoke of the weakness of the formal legal structure in Afghanistan. To illustrate this, he recounted how at least a court overruled a local jirga's awarding of one family's eight year-old child to another as compensation. But then, Rubin said, the judge said, there is no power to compel compliance with my ruling, so I hope the two families reach some private agreement. This sounds like the current lack of whistleblower protection at UNDP. Dervis will fight off the UN Ethics Office and make wronged employees go through the UNDP machinery, unless they agree to keep silence in exchange for continued jobs, like the ex-retaliator in chief. The search not only for Dervis, but relatedly for accountability and transparency at UNDP, continues. Watch this site.